6Saving JIM or Finding a Replacement? On October 26, a UN-appointed investigative panel known as the Joint Investigative Mechanism (JIM) issued a report blaming Syrian President Bashar al-Assad’s forces for a nerve gas attack against Khan Sheikhoun last April. JIM chemists traced the nerve agent used there back to Syria’s old stockpile of chemical weapons, suggesting that part of that stockpile remains hidden four years after Assad vowed to give it up for destruction. Russia, Assad’s ally, refuses to accept the JIM’s results and will block any sanctions proposed in the UN Security Council, where the report is set to be debated on November 7. Moscow has struck back by threatening to shut down the JIM, whose mandate is set to expire on November 16. Western nations are frustrated and want to find ways to punish Damascus for the chemical attack and for misleading international inspectors, but they recognize that they hold few cards and that Assad is likely to remain in power in Syria. Settling in for a future in which Syria remains a proliferation risk, many Western governments seem to have concluded that flawed international inspections are better than no inspections, tempering their interest in full-on conflict even as they fume over Assad’s behavior. Despite the JIM’s apparent investigative breakthrough, it looks unlikely that anyone will be held accountable for the gassing of Khan Sheikhoun. This is the third report in a series on Syria's chemical weapons question, after “Red Line Redux: How Putin Tore Up Obama’s 2013 Syria Deal” (February 2017) and “Mission Impossible? Investigating the Khan Sheikhoun Nerve Gas Attack in Syria” (July 2017). This report is part of “Arab Politics beyond the Uprisings: Experiments in an Era of Resurgent Authoritarianism,” a multi-year TCF project supported by the Carnegie Corporation of New York. A few years ago, it could have sparked a major international crisis, but now, the conclusion of a UN investigative panel that Syrian President Bashar al-Assad’s forces have used nerve gas is unlikely to change the course of the war. On October 26, an investigative panel created by the UN Security Council said it was “confident” that Assad’s air force was behind a chemical attack against the jihadi-controlled Syrian city of Khan Sheikhoun on April 4, 2017. Not only that, but the nerve gas used was drawn from old Syrian stockpiles that Assad had vowed to destroy in 2013, providing further evidence that Damascus has systematically cheated international inspectors for the past four years. Western governments are outraged at what they describe as Assad’s brutality and Russia’s complicity. Yet they are unable to seek accountability for the war crimes in Khan Sheikhoun through the UN Security Council, where Russia holds veto rights. Instead, it is the Russians that have gone on the offensive, threatening to eliminate the UN investigation altogether. As Western governments scramble to find other ways to follow up on the report and salvage continued inspections, the truth is that the Kremlin holds a better hand. Although Assad’s critics may unilaterally impose sanctions or initiate investigations outside the Security Council’s remit, such initiatives are unlikely to change the Syrian government’s behavior or bring perpetrators to justice. With Assad seemingly on track to win the Syrian war, some Western nations seem to fear that a major clash could weaken the international inspections regime in which Assad was snared in 2013. Ultimately, many seem to have concluded that ensuring continued access for international inspectors to Syria, even while recognizing that these inspections are flawed and cannot prevent Damascus from cheating on its commitments, is the best that can realistically be achieved. It is a cruel and painful tradeoff, in which accountability for the victims of gas warfare may ultimately be sacrificed to shore up a flawed and frail system of inspections in the service of long-term nonproliferation goals. But on this question, there are no easy answers—just different ways of muddling through and trying to weigh one principle against another. This Century Foundation report, which is the third in a series on Syria’s chemical weapons question—the previous two were “Red Line Redux: How Putin Tore Up Obama’s 2013 Syria Deal”1 from February 2017 and “Mission Impossible? Investigating the Khan Sheikhoun Nerve Gas Attack in Syria”2 from July 2017—is based on approximately two dozen interviews over the past year and in the last week, with diplomats and politicians, chemical weapons experts, and others involved with the investigations in Syria. It also draws on reports from the United Nations, the Organization for the Prohibition of Chemical Weapons, and other investigative bodies concerned with Syria, as well as on an extensive survey of media reports in English and Arabic. When surrendering its chemical arms stockpile after a Russian-American deal in 2013, Syria had also been forced to join the Chemical Weapons Convention and its implementing body, the Organization for the Prohibition of Chemical Weapons (OPCW).5 The OPCW is a multilateral organization with 192 state members—all signatories to the convention—that works closely with the UN, but is not part of it. The inspectors were, however, able to interview numerous witnesses, many of whom had been brought to their attention by either the Syrian government or by rebels and rebel-friendly NGOs, and worked to corroborate or falsify their stories using cross-examination techniques and physical and photographic evidence. OPCW scientists were able to conduct their own tests on wounded or deceased victims, and both sides also provided the inspectors with environmental samples from Khan Sheikhoun that tested positive for sarin. Child treated after Khan Sheikhoun attack. SOURCE Idlib Media Center. Neither Russian nor Syrian officials seemed to care whether their new claims about the attack were internally coherent or plausible, as long as they could exonerate Assad’s government. Already very hostile to the JIM since its chlorine identifications the previous year, Moscow and Damascus kept up a steady barrage of attacks on the mission’s credibility in the media. Both nations continually raised the need for a visit to the Shayrat Air Base and to Khan Sheikhoun, arguing that a failure to visit these sites would discredit the investigation. The JIM visited Shayrat in early October to interview air force personnel and collect information on flight routes and Syrian Arab Air Force equipment, but the inspectors did not seek to take environmental samples, since they had no information on a specific location associated with chemical activities. Russian-Syrian criticism then shifted from calling for a visit to attacking the JIM for its purported refusal to take samples. In its report, the JIM notes that it would be useless and a waste of time and resources to randomly pick up soil from an air base that stretches over 10 square kilometers, half a year after an alleged, brief presence of chemical weapons.20 Russian and Syrian officials have ignored this argument and continue to portray the JIM’s failure to collect environmental samples at Shayrat as evidence of unprofessionalism or a sinister conspiracy. The JIM team therefore had to make do with information that could be gathered by other means, including material already collected by the OPCW. The JIM inspectors added fresh witness interviews, including with Syrian officials and air force personnel, and brought new chemical examinations to the table. The JIM report noted that there was little evidence to support the early Moscow-Damascus narrative of an accidental sarin release from a bombed rebel depot. Echoing the OPCW Fact-Finding Mission, the JIM instead found that sarin had been released from a crater in northern Khan Sheikhoun, which Western governments and Syrian activists had consistently pointed to as the site of the attack. Russian and Syrian officials had also belatedly endorsed the crater theory, but argued that it had been caused by a ground explosion rather than an aerial bomb. The appearance of the crater was well documented with photographic, satellite, and video footage. On the strength of this evidence, several forensic institutes and independent experts consulted by the JIM concluded that it was “most probably caused by a heavy object travelling at a high velocity, such as an aerial bomb with a small explosive charge.” Metal fragments seen in the crater “were likely from an aerial bomb.” The Moscow-Damascus scenario of a ground explosion “could not be completely ruled out,” wrote the JIM, but it was judged “less likely,” partly due to the lack of shrapnel and explosive damage to certain nearby objects. The JIM’s most significant breakthrough came through an analysis of the sarin collected from Khan Sheikhoun. The OPCW’s Fact-Finding Mission had found sarin and related breakdown products in environmental samples provided by both the Syrian government and by rebel-connected NGOs and activists, and the inspectors had also conducted their own biomedical sampling of victims in Turkey. By analyzing these samples, the JIM was able to reverse-engineer the methods used to create the sarin found in Khan Sheikhoun. They found that it matched the sarin formula invented by the Syrian government. Sarin can be made through several different processes. In the Syrian case, government scientists had configured it as a binary weapon, meaning that it was stored in the form of two separate chemicals, methylphosphonyl difluoride (DF) and isopropanol. Immediately before an attack, the two chemicals would be mixed and poured into munitions, then handed over to the military for deployment by airplane or missile. Samples from sarin attacks in Syria in 2013, such as in Khan al-Assal and the Ghouta, also found hexamine traces. The 2017 attack in Khan Sheikhoun proved no exception: there was hexamine all over the sarin samples brought to OPCW inspectors, including in those volunteered by the Syrian government. These findings left inspectors with little doubt that the sarin had been produced according to the Syrian government’s formula. It was suggestive of a Syrian government role, and the JIM then managed to take its analysis one step further. What it meant was that part of Assad’s old stockpile still existed, saved from destruction and hidden somewhere, and was now being used to launch new chemical attacks. While alternative explanations could also be construed, they would rely on some combination of high-stakes conspiracy and freakish coincidences, involving a range of actors from al-Qaeda to the United States, as well as the JIM, the OPCW, and a large number of well-established international scientists, experts, and forensic institutes. While alternative explanations could also be construed, they would rely on some combination of high-stakes conspiracy and freakish coincidences, involving a range of actors from al-Qaeda to the United States, as well as the JIM, the OPCW, and a large number of well-established international scientists, experts, and forensic institutes. There was no physical evidence for such a humongous plot or mass outbreak of human error, and none of these hundreds of people from numerous nations and walks of life—including Syrians injured and deprived of loved ones on April 4—had broken the omertà. While such speculation could certainly be entertained as an intellectual exercise, it stood little chance of surviving an encounter with Occam’s Razor. The Russian government was contacted through two channels for this report. One did not respond, the other declined to comment. Saving JIM or Finding a Replacement? For the remainder of November 2017, and perhaps longer, Assad’s allies and enemies will tangle over the JIM report in international fora, including the UN and the OPCW. On November 7, the UN Security Council will convene to debate the report. The meeting will almost certainly be angry and unproductive, and British-American attempts to draft a sanctions resolution stand no chance given Russia’s veto powers and refusal to let the Security Council endorse any accusations against Assad.37 Western governments may then impose sanctions unilaterally, but they will likely first focus on salvaging the JIM—if possible. Several options are now being discussed among Western nations. One possibility is to act through the OPCW, which takes decisions through majority vote without veto rights. Two Western diplomats told me they may call a meeting of the OPCW’s forty-one-nation Executive Council, which would likely endorse the JIM report. Separately, on November 27, the OPCW’s Conference of States Parties will assemble in the Hague for a previously scheduled session to which all 192 OPCW member states are invited, and where the JIM report “will definitely be a major subject of discussion.”42 However, there are practical limits to what can be achieved through the OPCW, a traditionally consensus-oriented and technical organization where Assad’s critics may find support for their position but could still fail to rally a majority for tangible action or confrontative statements. UN Security Council meets after the Khan Sheikhoun attack. SOURCE: Rick Bajornas, UN Photo. Even if the JIM is eliminated there will still be international bodies seeking to attribute responsibility for chemical attacks in Syria, including the Human Rights Council’s Syria commission and possibly some form of OPCW or UN secretary general-backed efforts, in addition to national investigations and war crimes prosecutions. In other words, even if the JIM is eliminated there will still be international bodies seeking to attribute responsibility for chemical attacks in Syria, including the Human Rights Council’s Syria commission and possibly some form of OPCW or UN secretary general-backed efforts, in addition to national investigations and war crimes prosecutions. Such investigations would not be beholden to the Security Council, which means that Russia would have no power to influence or stop them. However, it also means they would be easier to dismiss as partisan creations and that Damascus could simply refuse to let them into Syria. 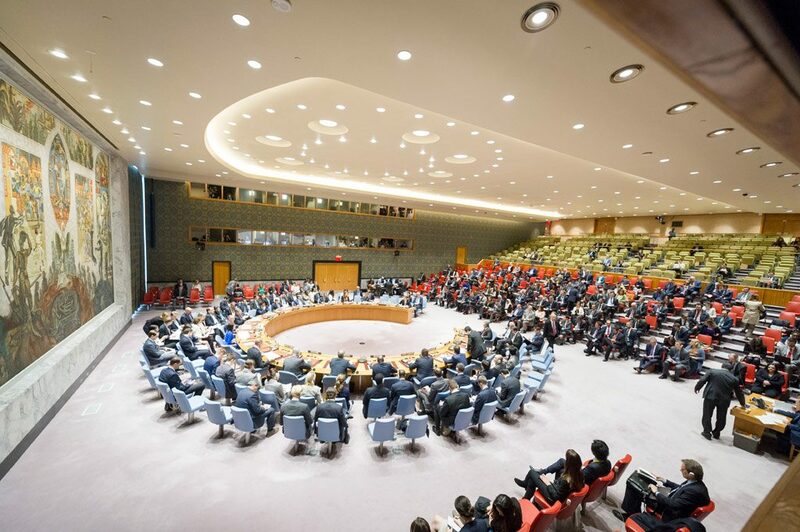 Coercive measures through the Security Council would remain subject to Russian approval. If all efforts to save the JIM or establish another collaborative mechanism fail, Western nations would likely be more inclined to seek retribution for chemical attacks through unilateral action. The U.S. attack against Shayrat in April, after the Khan Sheikhoun attack, came against the backdrop of Russian and Chinese vetoes defanging the JIM earlier that spring. Trump may have acted for other reasons, but many otherwise diplomacy-minded American officials also felt that there was no longer any point in waiting for a JIM investigation that would obviously be vetoed. The reality is that there are limits to how far Assad’s opponents will likely want to go to ensure accountability for chemical attacks, since at some point punitive military or diplomatic action may come to threaten Syrian cooperation—such as it is—with other aspects of OPCW work in Syria. As things stand, Bashar al-Assad is winning the war.49 Much may still happen to change this trajectory, and the Syrian central government will be hard-pressed to reestablish itself over the entirety of its territory. Nevertheless, Assad’s regime will likely remain a reality for years or decades to come. That has implications for how other nations approach the question of Syria’s chemical weapons program. Even as they seek ways to punish Syrian noncompliance with the Chemical Weapons Convention, Western nations apparently remain invested in the OPCW’s Syria inspections and eager to maintain the Fact-Finding Mission and Declaration Assessment Team, despite the limited results they have yielded so far. This may explain Western governments’ apparent unwillingness to end the OPCW’s chemical weapons talks with Syria or encourage the country to leave the Chemical Weapons Convention, no matter how often they repeat that Bashar al-Assad has violated it. In some ways, the inspections in Syria are now reduced to a charade. All involved seem convinced that the Syrian government is lying, has broken its disarmament pledges, and continues to store and use chemical weapons. And yet, without international inspectors periodically dropping in on Syrian research facilities to inspect work routines and take samples, and without OPCW teams continuing to verify that military sites disabled in 2013 and 2014 remain inactive, there would be no obstacles at all to the Syrian regime’s chemical rearmament. Even Assad’s harshest critics—indeed, perhaps particularly his harshest critics—seem prepared to live with continued cheating and violations of the Chemical Weapons Convention, as long as the OPCW can continue to shine a faint little light into the darkness of Syria’s military-industrial complex. Even Assad’s harshest critics—indeed, perhaps particularly his harshest critics—seem prepared to live with continued cheating and violations of the Chemical Weapons Convention, as long as the OPCW can continue to shine a faint little light into the darkness of Syria’s military-industrial complex, which has proven that it is capable of producing hundreds of tons of lethal weapons of mass destruction. There will almost certainly be no accountability for chemical attacks in Syria, but perhaps something can still be done to limit the fallout and prevent additional proliferation. Syrian critics of Assad are of course incensed at what they see as a failure to stop war crimes and stem the use of chemical weapons. “If these weapons are used and the perpetrator of these crimes isn’t held to account, it will develop and grow worse,” the anti-chemical weapons activist Nidal Shikhani told me, arguing that the credibility of international nonproliferation efforts is now at stake. Scientifically, Shikhani may be right. But although the crime may well have been solved by the JIM, it is unlikely to be punished. As Syria slowly fades from the headlines, few will bother to follow arcane debates at the Security Council or care what happens to the UN and OPCW’s chemical weapons investigations, ineffectual and tainted by partisanship, political maneuvering, and vetoes at the Security Council. And yet, there is one place where people are still waiting to hear what the world has to say. April 4 made a mark on all of Khan Sheikhoun, where some citizens now struggle to cope with psychological traumas and many live in fear of another gas attack. Sarin survivors from half a year ago still suffer, Alaa says, explaining that April 4 made a mark on all of Khan Sheikhoun, where some citizens now struggle to cope with psychological traumas and many live in fear of another gas attack. Aron Lund, “Red Line Redux: How Putin Tore Up Obama’s 2013 Syria Deal,” The Century Foundation, February 2017, https://tcf.org/content/report/red-line-redux-putin-tore-obamas-2013-syria-deal. Aron Lund, “Mission Impossible? Investigating the Khan Sheikhoun Nerve Gas Attack in Syria,” The Century Foundation, July 2017, https://tcf.org/content/report/mission-impossible-investigating-khan-sheikhoun-nerve-gas-attack-syria. Thanassis Cambanis, “After Khan Sheikhoun, ‘War Crimes’ Might Have No Meaning,” The Century Foundation, April 4, 2017, https://tcf.org/content/commentary/khan-sheikhoun-war-crimes-might-no-meaning. Aron Lund, “Return of the Red Line,” IRIN News, April 26, 2017, https://www.irinnews.org/analysis/2017/04/26/syria-return-red-line; Aron Lund, “Why Haven’t Chemical Weapons Inspectors Gone to Syria’s Shayrat Air Base?” The Century Foundation, June 29, 2017, https://tcf.org/content/commentary/havent-chemical-weapons-inspectors-gone-syrias-shayrat-air-base. Lund, “Red Line Redux,” 2017. “The Declaration Assessment Team spoke informally of loopholes in the declaration that you could drive a truck through, that you could drive a whole chemical weapons program through,” recalls the American chemical weapons disarmament expert Paul Walker. “There was just extreme skepticism given the lack of information in the Syrian declaration.” Author’s interview with Paul Walker, Green Cross International, Skype, June 2017. Specific problems included the Syrian government’s persistent refusal to provide documentation for chemical arms that it claimed to have destroyed without OPCW involvement, or allow the Declaration Assessment Team to interview officials involved with the issues in dispute, as well as suspicions of unreported chemical arms production. As inspections continued and the Declaration Assessment Team gained access to new locations, additional irregularities in the Syrian claims were spotted, raising new question marks. According to OPCW Director-General Ahmet Üzümcü, “a majority of sample results indicated the presence of unexpected or undeclared chemical compounds” that “indicate potentially undeclared chemical weapons-related activities at these locations.” – “Conclusions on the outcome of consultations with the Syrian Arab Republic regarding its chemical weapons declaration,” OPCW, EC-82/DG.18, July 6, 2016, https://www.opcw.org/fileadmin/OPCW/EC/82/en/ec82dg18_e_.pdf. Interview with Ralf Trapp, former senior OPCW official and currently an international consultant on chemical and biological weapons arms control and related security issues, phone, May 2017. Khan Sheikhoun—and indeed most of Idlib—is controlled by hardline Islamists, including extremists with ties to international terrorist groups and kidnappings. A previous bid to conduct a cross-line investigation to an area close to Khan Sheikhoun in April 2014 nearly led to the death of several inspectors after a roadside bomb was triggered by unknown assailants, and they were briefly detained by a local rebel faction as they tried to flee back to government-held Syria. The Fact-Finding Mission considered visiting Khan Sheikhoun, but decided against doing so after finding that they could fulfill their mandate, which was simply to determine whether or not a chemical attack had taken place, without taking such risks. As for Shayrat, the mission argued that since it was not allowed to speak to the identity of the perpetrator, a visit to the air base would be outside of its remit. This was stated in the Fact-Finding Mission’s June 29, 2017 report, but the OPCW issued an additional clarification in late October in response to Russian and Syrian criticism. See “Letter dated 25 October 2017 from the Secretary-General addressed to the President of the Security Council,” United Nations, S/2017/905, October 27, 2017, http://undocs.org/S/2017/905. “After reading the [OPCW Fact-Finding Mission] report on Khan-Shaykhun, one thing is clear: sarin or a similar agent was used there,” Russian OPCW representative Alexander Shulgin told the OPCW Executive Council in July 2017. See “Remarks by Permanent Representative of the Russian Federation to the OPCW Ambassador and head of the Russian delegation Alexander Shulgin at the 55th meeting of the OPCW Executive Council (the report on investigation of the Khan Shaykhun incident), The Hague, July 5, 2017,” Russian Ministry of Foreign Affairs, July 10, 2017, http://www.mid.ru/en/foreign_policy/news/-/asset_publisher/cKNonkJE02Bw/content/id/2811032. “Report of the OPCW Fact-Finding Mission in Syria regarding an alleged incident in Khan Shaykhun, Syrian Arab Republic, April 2017,” S/1510/2017, June 29, 2017, https://www.opcw.org/fileadmin/OPCW/Fact_Finding_Mission/s-1510-2017_e_.pdf. The Fact-Finding Mission report and other OPCW statements characterized certain biomedical or environmental samples from Khan Sheikhoun as bearing evidence of “sarin or a sarin-like substance,” a phrase that in OPCW jargon indicates sarin or closely related nerve agents, such as soman. Conspiracy theorists have seized on this phrase as evidence that the OPCW wasn’t quite sure what it had found, but chemical arms experts tell me this is unadulterated nonsense, and the Fact-Finding Mission report does in fact make clear that the final finding was of sarin, full stop. The content of certain samples could not be narrowed down further than to a sarin-style nerve agent—hence the use of the phrase “sarin-like substance” for these samples—but other tested materials were unambiguously found to contain sarin. All sides have endorsed this conclusion, including American, French, British, Chinese, Russian, and Iranian officials, as well as the Syrian government and its opponents. This is further reinforced by the JIM report of October 26, which goes into detail about the composition of the sarin used in Khan Sheikhoun. See for example “Chemical Attack in Syria – National Evaluation presented by Jean-Marc Ayrault following the Defense Council Meeting (26 April 2017),” French Foreign Ministry, April 26, 2017, https://www.diplomatie.gouv.fr/en/country-files/syria/events/article/chemical-attack-in-syria-national-evaluation-presented-by-jean-marc-ayrault. Luis Martinez and Paul Blake, “US releases flight path of plane used in Syria chemical attack,” ABC News, April 7, 2017, abcnews.go.com/International/us-releases-flight-path-plane-syria-chemical-attack/story?id=46651125. “Army general Command categorically denies using chemical materials in Khan Shaikhoun,” Syrian Arab News Agency, April 4, 2017, http://sana.sy/en/?p=103554. Several fruitless attempts have been made to elicit comment on these issues from Syrian officials since April 2017, including in the past week. Russian government officials either did not respond to requests for comment, or referred to previous statements while declining to answer any specific questions on why Moscow keeps changing its story. 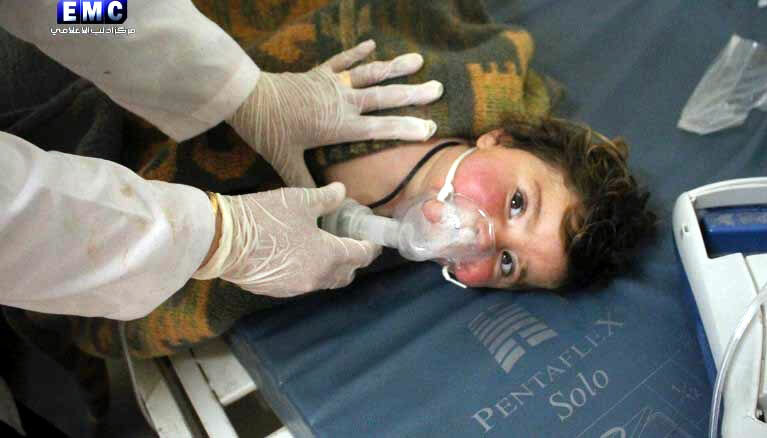 “Security Council Unanimously Adopts Resolution 2235 (2015), Establishing Mechanism to Identify Perpetrators Using Chemical Weapons in Syria,” United Nations, SC/12001, August 7, 2015, https://www.un.org/press/en/2015/sc12001.doc.htm; “The JIM, as a subsidiary organ of the United Nations Security Council, carries out its further investigations and makes its findings as an independent body,” I’m told by an OPCW press spokesperson. “It presents its reports to the Security Council, and informs the OPCW.” – Author’s contact with the OPCW, email, October 2017. Lund, “Red Line Redux,” 2017. The JIM’s October 26, 2017 report blamed the Islamic State for a sulphur mustard attack near Aleppo. Islamic State-related issues will not be dealt with in this report. Although the JIM’s attribution of chemical attacks to the Islamic State is by no means unimportant, the legal or political ramifications are limited since the group already operates as an outlaw non-state actor. The JIM initially had trouble securing a visa from the Syrian Foreign Ministry for its Damascus liaison, as JIM head Edmond Mulet complained before the UN Security Council, but, according to the JIM’s own reporting, this problem was resolved by mid-July and Damascus “engaged constructively” with the inspectors thereafter. “Taking samples was not an objective of the visit to Sha‘irat airbase,” the JIM writes in its October report. “The Mechanism had determined that the collection of samples at the airbase would not advance the investigation. The Mechanism considered that if a single chemical munition had been flown from that base, there was little chance of finding any trace of sarin or its degradation products at an airbase of that size (approximately 10 km2) without specific information as to where to collect samples.” On the controversies about visits to Shayrat, see Lund, “Why Haven’t Chemical Inspectors Gone to Syria’s Shayrat Air Base,” 2017. The JIM’s seventh report can be found enclosed in “Letter dated 26 October 2017 from the Secretary-General addressed to the President of the Security Council,” United Nations, S/2017/904, October 26, 2017, undocs.org/S/2017/904. The Russian government has protested this conclusion, arguing that the Syrian jets could not hit Khan Sheikhoun in the time interval required. Russian officials say this is evidence that their own theory of a ground explosion is more credible. See “Russia rejects possibility of chemical agents’ use in Khan Shaykhun from Syrian aircraft,” TASS, November 2, 2017, http://tass.com/defense/973875. The significance of hexamine in environmental samples from the Ghouta in 2013 was first noted by Dan Kaszeta, an American-British chemical warfare expert and consultant. See Dan Kaszeta, “Initial Observations on the ’Final Report of the United Nations Mission to Investigate Allegations of the Use of Chemical Weapons in the Syrian Arab Republic,’” Strong Point Security, December 13, 2013, http://strongpointsecurity.co.uk/site/wp-content/uploads/2013/12/Initial-Observations-on-12-Dec-UN-report.pdf. Interview with Ralf Trapp, former senior OPCW official and current international consultant on chemical and biological weapons arms control, phone, May 2017. Author’s interview with Magnus Normark, Swedish Defense Research Agency, phone, October 2017. “Of course,” Normark added, “if the Syrian government stored these weapons and ammunition in a site they lost control over, someone could have captured them, but then they’d have to deliver them to the site of the attack as well, in the circumstances that actually prevailed.” As the JIM had noted, that would entail using a lab and trained chemists to perform the sarin mixing, and then, per the JIM’s conclusions, launching it from an aircraft. Although the JIM was confident about its conclusion, it did note uncertainties and contradictory information. An interesting note is made in the report’s second annex, where the authors note that rebel and pro-rebel groups may have produced misleading evidence and engaged in media theatrics, whether as a result of the chaos of the moment or as a way to embellish or distort reports about the attack. However, this behavior, while possibly indicative of attempts to manipulate reporting, was considered incidental to the issue of how and from where sarin was released in Khan Sheikhoun. “While some potentially important irregularities were identified throughout the rescue operation and in medical records,” the JIM wrote, “they may be explained by factors such as poor training or the chaotic conditions, or by attempts to inflate the gravity of the situation for depiction in the media.” As much as they may seem worthy of further investigation, these issues had no bearing on the JIM’s decisive conclusions, which concerned the origin and quantity of the sarin used, the time of the attack, the way the crater was created, and Syrian Arab Air Force flight paths. Author’s interviews with four chemical weapons or investigative specialists, October-November 2017. Author’s interview with Paul Walker, Green Cross International, email, November 2017. Author’s interviews with three Western diplomats, November 2017. Author’s interview with U.S. State Department official, phone, November 2017. “Syria rejects report of OPCW-UN Joint Investigative Mechanism,” Syrian Arab News Agency, October 27, 2017, http://sana.sy/en/?p=116695. “Syria chemical probe report ‘amateurish’ — Russia’s UN mission,” TASS, November 1, 2017, http://tass.com/world/973526; ”Russia rejects possibility of chemical agents’ use in Khan Shaykhun from Syrian aircraft,” TASS, November 2, 2017, http://tass.com/defense/973875. It bears noting that the issue of on-site inspection is exclusively being raised in cases where Assad’s government has been found guilty of chemical attacks. Both the Russian and the Syrian government have been supportive of JIM reporting that attributed chemical attacks to the Islamic State without visiting the alleged attack sites. Author’s interview with U.S. State Department official, November 2017. For more on the September 2013 agreement, see Lund, “Red Line Redux,” February 2017. “Britain calls for UN sanctions on Syria over sarin attack,” AFP/Telegraph, October 28, 2017, http://www.telegraph.co.uk/news/2017/10/28/britain-calls-un-sanctions-syria-sarin-attack. “Security Council Fails to Renew Mandate of Joint Investigative Mechanism on Chemical Weapons Use in Syria, as Permanent Member Casts Veto,” United Nations, SC/13040, October 24, 2017, http://www.un.org/press/en/2017/sc13040.doc.htm. The draft resolution can be read at: http://undocs.org/S/2017/884. “There are some sixty cases of alleged use of chemical weapons in Syria that are currently examined by OPCW and that could later be referred to JIM. One can also not exclude the possibility of new attacks. If JIM did not already exist, we would simply have to invent it,” said Sweden’s ambassador to the UN, Olof Skoog, after Russia vetoed a JIM extension in late October. “Explanation of Vote by Sweden at the UN Security Council following the consideration of draft resolution S/2017/884,” Government of Sweden, October 24, 2017, < a>. Nabil Abi Saab, “Russian draft calls on JIM to ‘reevaluate earlier assessments, conclusions’,” UN Report (Documents), November 2, 2017, https://un-report.blogspot.se/2017/11/russian-draft-calls-on-jim-to.html. Author’s interview with U.S. State Department official, November 2017. Author’s interview with Paul Walker, November 2017. Author’s interview with a Swedish diplomat, phone, November 2017. Author’s interview with John Hart, a chemical weapons expert at the Stockholm International Peace Research Institute (SIPRI), email and phone, October 2017. “Report of the Independent International Commission of Inquiry on the Syrian Arab Republic,” United Nations General Assembly, A/HRC/36/55, August 8, 2017, undocs.org/A/HRC/36/55. “Secretary-General’s Mechanism for Investigation of Alleged Use of Chemical and Biological Weapons,” UN Office for Disarmament Affairs, https://www.un.org/disarmament/wmd/secretary-general-mechanism. Author’s interview with a Western diplomat, phone, November 2017. Lund, “Syria: Return of the Red Line,” April 2017; “Discours d’Emmanuel Macron en ouverture de la Conférence des Ambassadeurs,” French Presidency, August 29, 2017, http://www.elysee.fr/videos/new-video-44; “Chemical weapons a red line in Syria, France’s Macron says,” Reuters, May 29, 2017, https://www.reuters.com/article/us-france-russia-syria-macron/chemical-weapons-a-red-line-in-syria-frances-macron-says-idUSKBN18P1OH. Aron Lund, “How Assad’s Enemies Gave Up on the Syrian Opposition,” The Century Foundation, October 17, 2017, https://tcf.org/content/report/assads-enemies-gave-syrian-opposition. The Syrian government’s behavior “is somewhat similar to what happened on the nuclear side with Iran,” the Swedish diplomat says. “Sometimes it was felt that Iran wasn’t being forthcoming with information, and that information was missing. First you would get nothing but then one day before a meeting you would often receive a large amount of information that may not have been what you had asked for, so that Iran would be able to claim at the meeting that they were cooperating. That process went on for a very long time, and then a deal was finally struck when the situation was politically ripe for it. What’s important is that you report clearly about the difficulties you face,” says the diplomat. “That’s the way to do it, not to break contacts.” Author’s interview with a Swedish diplomat, phone, November 2017. A previous version of this report suggested that Syria could be expelled from the OPCW as a punitive measure, but this is not the case, and the text was amended on November 8, 2017 to reflect that fact. Nations join the OPCW by signing the Chemical Weapons Convention, which Syria did in 2013. As noted in §2 of the convention’s Article XIII, no member state can be expelled, though §2 of Article XVI allows signatory states to withdraw from the convention under certain conditions. While the OPCW could recommend the UN Security Council to order sanctions and other coercive measures against one of its member states, the OPCW’s own internal punitive measures are restricted to suspending rights and privileges granted under the convention, e.g. by stripping voting rights, refusing the member state to speak at meetings, and preventing its delegates from accessing certain flows of information. The Chemical Weapons Convention can be accessed via the OPCW website: https://www.opcw.org/chemical-weapons-convention. Author’s interview with Nidal Shikhani, manager of the Brussels-based activist group Same Justice/Chemical Violations Documentation Center in Syria, phone, October 2017. Author’s interview with Alaa al-Yassin, a nurse at the Rahma Hospital in Khan Sheikhoun, voice and text chat, November 2017. Contact with Alaa al-Yassin was arranged by the organization Same Justice/Chemical Violations Documentation Center in Syria, a Belgium-based Syrian activist group that documents chemical attacks in Syria. I cannot independently verify Alaa al-Yassin’s statements, but I have found no reason to doubt that they were genuinely and freely expressed.